Patrick McNamara, grandson of Indianapolis 500 veteran riding mechanic James David (Jim) McNamara, who is usually simply listed as "J.D. 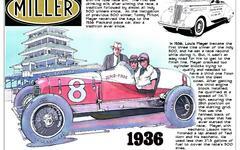 McNamara" in historical accounts, provided two wonderful images of his grandfather and race driver Harry Endicott. According to Patrick, the two men raced together in the 1913 Indianapolis 500. Jim was born November 15, 1884 in Grafton, Missouri, a town that no longer exists. He died February 5, 1960 in Tinley Park, Illinois. You can find an article on five of Jim McNamara's contemporaries in the 1913 Indianapolis 500 elsewhere on First Super Speedway. Also, check out this additional photo of Harry and Jim. This image is from late 1912 and was taken at Milwaukee - presumably the Milwaukee Mile - at the Wisconsin Cup, an event Endicott and McNamara won driving for the Mason team. The Masons were developed by the Duesenberg brothers, Fred and August.The reasoning behind Endicott's full face headgear is topic of speculation but drivers of the era did experiment with such equipment due to the dusty courses. 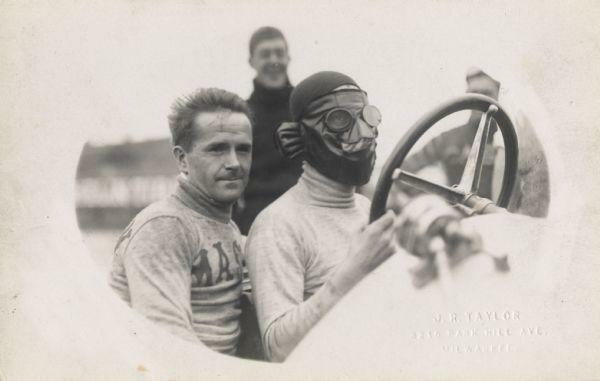 Check out this image of Joe Jagersberger at the 1911 Indianapolis 500. If you have any additional information about Patrick's grandfather - or Harry Endicott - please let contact me.